I have never seemed to have any problem thinking in 3D. What should you look for in kids that are good at this? Perhaps I can give a few pointers. Back in 1968 I was tested for intelligence and they told me I scored very high on visual-spatial processing. This was no surprise to me, because I was always making things. I made geodesic domes, for instance, using some Buckminster Fuller designs I found in a library. I was always drawing objects, working them out in 3D, learning how to shade them, or to draw shadows. Other kids thought I was a bit different. And I guess they were right. I constantly drew in class, much to the chagrin of my teachers. The drawing was a useful talent when it came to such courses as geometry and art. But it did cost me some grades in history and English. 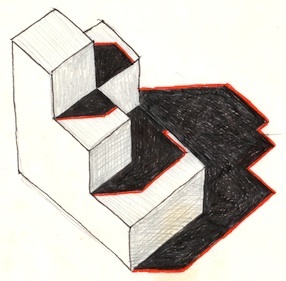 Fortunately the spatial reasoning helped connect me to mathematics and I also found I had a head for numbers and symbol processing. I guess that's why I ended up a programmer. My early drawings were simplistic, but that soon changed to the fantastic. 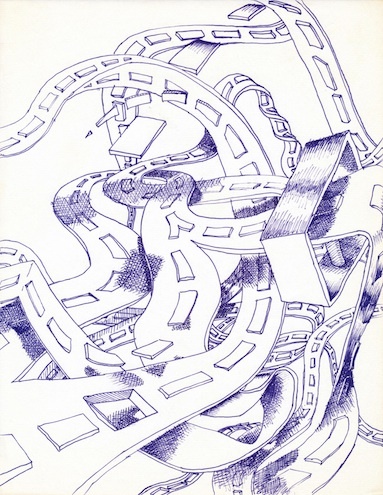 By the time I was in high school, my drawings were simply out there. 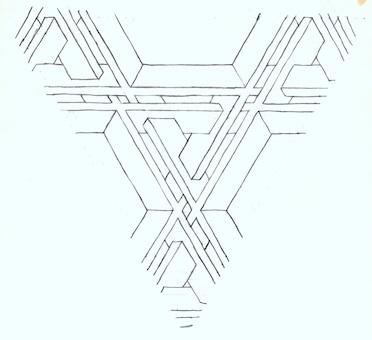 Take, for example, this drawing of roads intertwining. Some roads can be seen spiraling. Or the lines on the road can be seen coming off into space. Or merging. My favorite illusion is the lines on the road becoming a thing unto themselves and floating in space. Even casting shadows. My point is, if you see a kid drawing this kind of stuff, you might want to encourage it. Or at least try to understand what it is getting at. In my case, my brain just wanted to make something interesting. The real world was kind of boring compared to what the imagination can provide. The holes are interesting too. They represent negative space, and provide some contrast. For me, eventually, fantasy generally gave way to impossibility. Impossible figures were the rage when I was a kid, and I turned it into a science. For instance, in this small sketch, It becomes important to me to generate the most convincing illusion, or to provide a "correct" interpretation of the impossible figure. But even impossible figures can lead to wild speculation of interweaving. 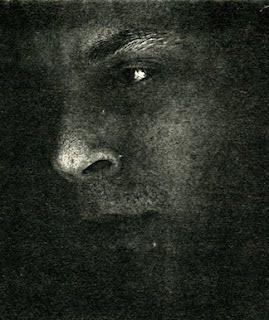 This image, done on light aqua paper, was actually more a design than a convincing illusion. So really it's more of an intellectual exercise. 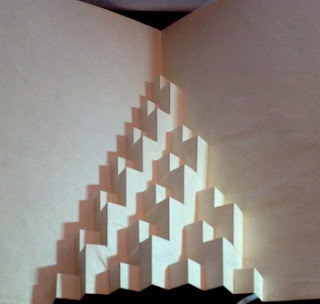 And its triangular clipped format makes it even more of an art piece. All this was actually done without grid paper of any kind. Rather, I relied upon a ruler, a protractor, and a pencil. And I did have to erase some of my construction lines. But I did buy some grid paper, that was designed for gaming. This was hexagonal grid paper that gamers used to design their worlds. I found such games tedious. In Caltech, several people "disappeared" into the game Dungeons and Dragons. And they were never heard from again. So I was wary of that obsession, and you should be too, when it comes to your kids. Still, minecraft is an excellent game for teaching spatial reasoning. 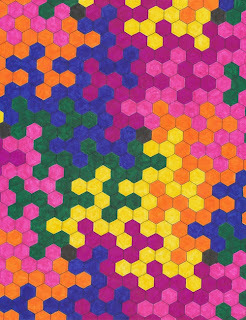 In this image, the hexagonal paper is used to create a fractal-like pattern. Really, it's closer to a space-filling curve. It's an example of the kind of fun I had in the 1980s. The colors were simply drawn in with a set of felt pens. I don't think I have used the minimum number of colors. As we all know, four should suffice. But back in 1978, I was interested in meshes long before I did any 3D programming. 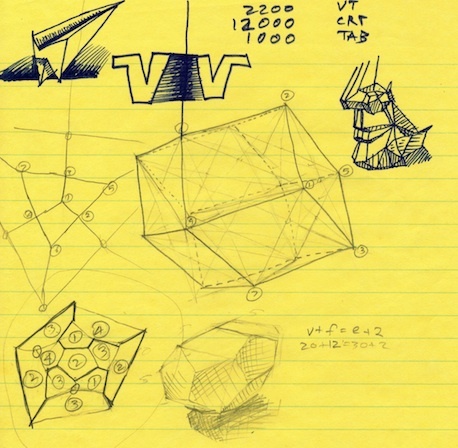 Shown on this yellow note paper sheet is a mesh construction of a face, a Hamiltonian unwrapping of a dodecahedron, and a picture of a dodecahedron (at the bottom) which has been stretched. In the center is a rhombic dodecahedron constructed around a nesting cube, which can barely be made out. To the left is a Hamltonian unwrapping of the same rhombic dodecahedron. The notes are simply device addresses on a VAX 11-780, I think. Good times! Even better was a paper-folding project I did for no particular reason. Perhaps it was for a fold-out birthday card. I simply can't remember now. Here are my sketched plans for it. 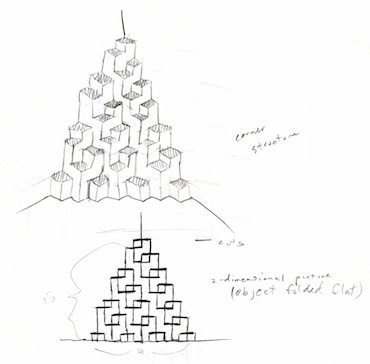 It appears to be a corner-nested construction made of cubes. This should be familiar to any minecraft user. Below it I have figured out how it can be folded flat (and this is one of the more interesting tasks that might be used to test spatial reasoning). You cut the horizontal lines, and fold on the vertical lines to create the result. I was proud enough to save an actual example of the final product, which I unfolded and photographed. So you can see the result of my labors to the left. Yes, there is a little creasing in the paper, but it has been folded flat for many years. Actually I was kind of surprised it has survived. And for my final trick, I have my self-portrait with copy machine. That's me at 16 or so. Probably about the time I went to UC Berkeley on the National Science Foundation seminar. And met Professor Lehmer. And got tear-gassed in a demonstration near the campus. And had to duck into Harry's Hofbrau. Where I was served a beer. But that's a story for another day. another interesting one, whats really sticks wrote learning or hands on a tactile world?